Industrial hemp plastic could be the beginning of the end to the Age of Plastic! Let’s face it plastic is a problem, it is not environmentally friendly and we STILL don’t even know it’s expiration date but Hemp holds many possibilities as an Eco-friendly replacement. Among global warming, oil spills, and fracking disasters our planet screams out “It’s Time For A Change”. We are addicted to oil and most of us don’t even recognize it. First of all it is used to make everything plastic, as well as, fuel vehicles, make shoes, and many other products. There are companies all over the globe including the United States that have been using hemp for various materials, including a hemp plastic that is 100% biodegradable. We do have a plastic addiction here in the US, but fortunately there are companies out there trying to replace plastic with something more environmentally friendly. The Farm Bill Section 7606 was passed allowing industrial hemp to be grown and harvested for research and trial runs at the end of 2014. It is estimated that 19 states are currently involved with the research and development of industrial hemp, American Hemp is just one of the first newly established companies. They are located in Winston Salem, North Carolina. The company deals with research and development programs that are designed to improve various hemp products and materials. They strive to make 100% environmentally safe materials that will create less of a negative impact on the Earth. American Hemp offers processed hemp to various manufacturers. They provide hemp fibers for textiles, building materials, biocomposites, hempcrete and many other materials. Will Hemp Plastic Ever Thrive In The US? There are several entrepreneurs and small business owners currently seeking funding to endorse their hemp products. However, if you look to Australia or India you will notice there are already several well established companies offering many different hemp products including hemp plastic, clothes, shoes, building materials, and much more. 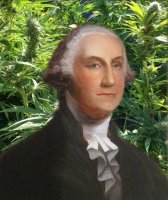 One of our famous founding fathers, George Washington, famously grew hemp and Henry Ford was making car parts out of industrial hemp back in the 1940’s. There is even a rumor that Mr. Ford never intended for his vehicles to run on gasoline, rather a hemp based fuel, but you never know. If you do a little searching it won’t take long before you stumble upon some really amazing products made using hemp. Studies have been underway for years now and there are businesses all throughout the world already providing hemp made products. Hemp takes less time to grow, creates more oxygen, and has many uses from food to building materials. Replacing plastic with hemp plastic is a very crucial move we need to make in the United States. There is another way we can see and it is time we make that change. Elaina Garcia is a traveling writer. She lives as close to organic as possible and she supports the Marijuana Movement in many aspects.